Today is Saturday December 4th. Tonight I'm going to see Bon Jovi rawk the stadium ("YEAH! HELLO WISCONSIN!" etc). I wouldn't say I'm a huge Bon Jovi fan. I don't own any of their albums, or any singles for that matter. I am going mainly for the hits of my youth. And really, how often are Bon Jovi going to play my city? I'll probably want to be able to say I was there. I might even buy a T-shirt. Also I am going with a bunch of my friends, and the fun they will make will make up for me not knowing a lot of the material. The date and day is interesting though, because a long time ago, on another Saturday December 4th, I went to another big concert. This was in 1993 when U2 played Auckland on the ZooTV (wiki) tour. I was reminded of it last week when they played Auckland again and a friend of mine made the trip up to see them. I was talking with her about the time I saw them and realised it was almost exactly half my lifetime ago. 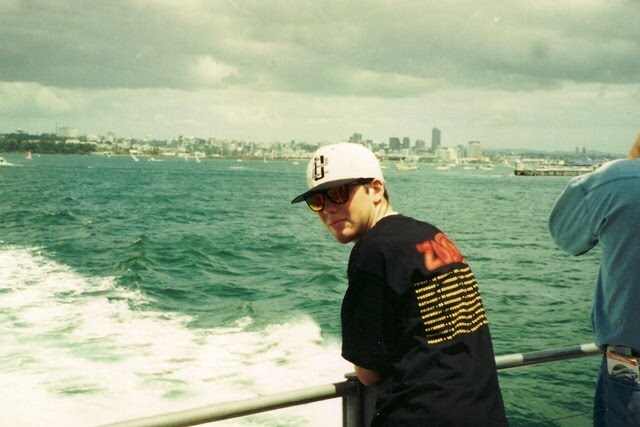 Here I am on the ferry to Waiheke the next day (the concert merch people having clearly seen me coming), 17 years old and never been kissed. Or something to that effect. Note the lack of Skytower on the Auckland skyline. It is funny how that structure almost feels like it has always been there, when really it hasn't been there that long. It was a hell of a weekend. It ended our last week of high school exams, and effectively high school itself since 1993 was my last year of school. The trip being long planned (me and two schoolmates, you know who you are if you are reading), we finished up our exams and headed off to a couple of end of year parties. I remember staying out until around 3am, and not going to bed because our driver (Dad, providing both car and piloting for the adventure) wanted to get on the road early (like 6am early). I hadn't yet acquired the knack of sleeping in cars (and who needs sleep when you are 17 anyway? ), so stayed awake the whole way to Auckland, arriving mid afternoon. Dad promptly disappeared to his motel (muttering something about "any fool can be uncomfortable") and promised to pick us up in the morning, leaving us at a campsite to pitch our tent and head to the gig. I quickly found a tent peg with the sole of my foot and cut it open, resulting in a limp for the rest of the occasion, not helped by it being a 40 minute or so walk to the gig. And what a gig it was. After all this time, it is still easily in my top 5 for sheer spectacle. They might not be fashionable or relevant (although in 1993 they were still considered to be doing interesting things musically, and the show concept itself was a big-picture statement), but they do know how to put on a show. Setlist for the night is here. I remember cars mounted above the stage, the whole stage rig lit by dozens of strobe lights for the climax of "Until the end of the world", Bono phoning a house overlooking the stadium to ask what they thought of the gig, a single guy using the video confessional to display his phone number to 60,000 people at once, singing as loud as I could to the songs I knew (which was most of them), the great visuals that accompanied the songs on the many screens, and a thousand other details. It was epic. I was and remain an early-mid u2 fan in terms of output (they kind of lost me and got less interesting after 1997's 'Pop'), so the ZooTV tour and era was probably the perfect time for me to see them live.